Autonomic dysfunction is frequently observed in patients with multiple sclerosis (MS), but clinical studies disagree on the frequency and type of abnormalities in autonomic function tests. Orthostatic dizziness (OD) has been reported in up to 49% of patients, but the pathophysiological mechanisms are poorly understood. This study investigated cardiovascular reflex tests and their association with OD in patients with MS in order to examine the hypothesis that the sympathetic nervous system is specifically involved in these patients. 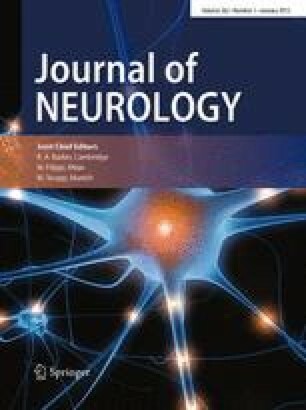 Forty patients with clinically active relapsing-remitting (n = 27) and secondary progressive MS (n = 13), aged 35.0 ± 8.5 years, were studied by parasympathetic (heart rate responses to the Valsalva maneuver, deep breathing, and active change in posture) and sympathetic function tests (blood pressure responses to active change in posture and sustained handgrip), and by spectral analysis of heart rate variability during rest and during standing. Results were compared to those obtained in 24 healthy volunteers, aged 29.4 ± 7.2 years. A standardized questionnaire was used to evaluate symptoms of orthostatic intolerance. Abnormal responses on at least one cardiovascular reflex test were observed in 40% of MS patients, compared to 17% of the control group, with a statistically significant involvement of the sympathetic vasomotor system. Orthostatic intolerance was reported in 50% of patients (controls: 14%, P < 0.006). Subgroup comparison of patients with and without OD suggests that orthostatic intolerance results from impaired sympathetic vasoconstriction. These results provide further evidence that the sympathetic nervous system is involved in patients with MS.